You will often come across some of the next generation of All Pays slot games as they are known when playing at any online or mobile casino site, and there are a number of them that you can play when accessing a mobile or online casino using the QuickSpin range of slot games. 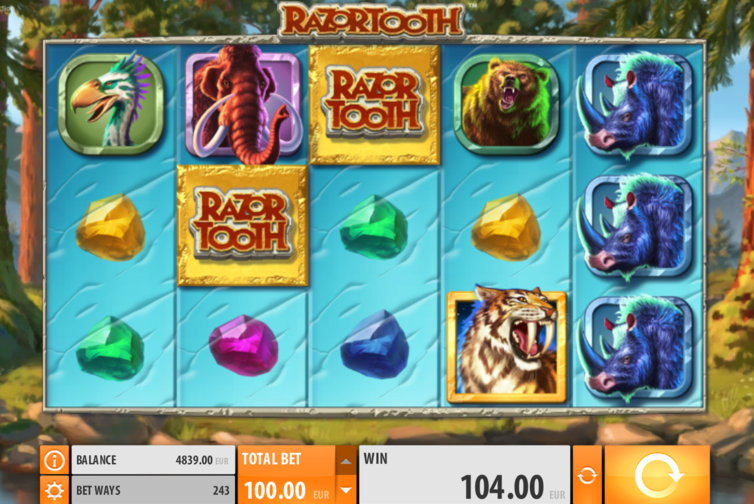 One slot which does have something of a high variance playing structure is their Razor Tooth slot on which you will be playing off an impressive 243 ways to win. This slot has been made complete with a very exciting bonus game that can be triggered from any spin! 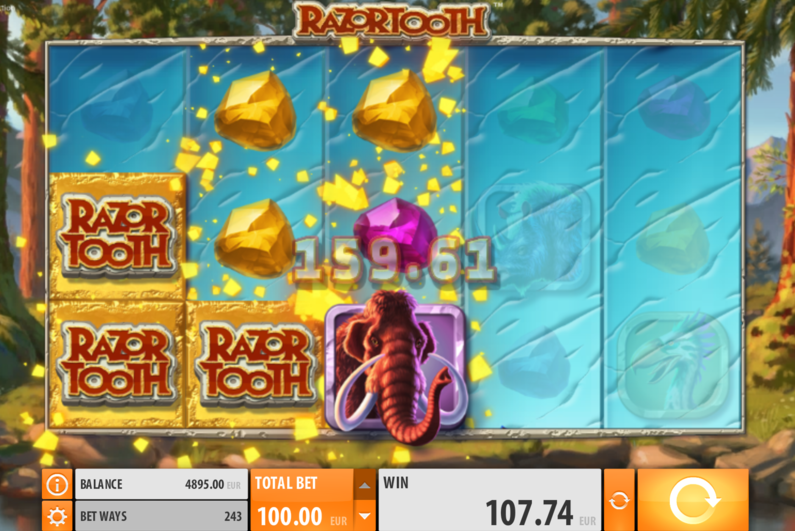 Every possible winning combination that could be formed on the screen will be in live play whenever you send the reels of the Razor Tooth slot game spinning, and that works out at a huge 243 ways to win per spin! However what many slot players appreciate about 243 ways to win slots such as this one is that they are only going to have to wager 25 coins to have all of those ways to win activated, and when playing this slot as the coin values can be set at just one penny that means a minimum bet wager will only cost 0.25. The maximum stake per spin for reference is 100.00! It is during the base game when playing off any spin for any stake amount that you could be awarded with a special randomly awarded bonus game feature. That bonus game is known as the Hunt feature and when it has been awarded to you up to three Wild symbols are going to be added to the reels. There is also a second bonus game that can be triggered which is described below, and one thing that does ensure you should trigger those two bonus features fairly regularly is that the Razor Tooth slot has been set to return a payout percentage over the long term of a respectable and high 96.62%! You will not be awarded with a huge number of free spins whenever you are lucky enough to trigger the free spins bonus game when playing the Razor Tooth slot game, however something unique will happen on those free spins whilst they are all playing off that can dramatically increase your overall winning chances! It will take all three of the Bonus scatter symbols to appear in view to trigger the feature and then you are awarded with a set of 5 free spins. As each of them is playing off on each spin one or two Savage Wild symbols are going to be added to a random reel or reels. As you have 243 ways to win in live play then you will be hoping those Stacked Savage Wild symbols are added to the lower numbered reels as that way you will get plenty of winning combinations forming! There are going to be three wild symbols added to the base game reels during the randomly award Hunt feature and that gives you a much greater chance of forming winning combinations whenever that feature has been awarded to you! During the bonus feature however what you may see happening as you are playing them off is that up to two of the reels could randomly become filled with wild symbols which does massively increase your chance of winning big depending of course on just which reels those wild symbols fill up, so lookout for that during the free spins bonus game! 5 Tiger symbols in a line pay 200 coins. 4 Tiger symbols in a line pay 80 coins. 3 Tiger symbols in a line pay 40 coins. 100 coins are paid when 5 Mammoth symbols line up. 40 coins are paid when 4 Mammoth symbols line up. 25 coins are paid when 3 Mammoth symbols line up. It is true to say that there are now hundreds of online and mobile slots that offer an All Pays, 243 ways to win type of play structure so you do have a huge choice in regards to which ones to play if those types of slots appeal to you. However, having said that what does make this slot stand out is the fact that the free spins bonus game has guaranteed Stacked Wild symbols that will come into play that will land on one or two reels. That fact alone does make this slot highly playable, however when coupled with the high payout percentage also attached and on offer on this slot is it a game we would recommend every slot player tries out whenever they can do, as that free spins game can be a potentially huge paying one!